This image is taken from the Tichnor Brothers Archives. Tichnor Brothers of Boston, MA was a major publisher and printer of postcards from 1912-1987. They have a collection of their postcard proofs from the 1930’s and 1940’s at the Boston Public Library. It’s a fascinating collection of images showing life in the US years ago. 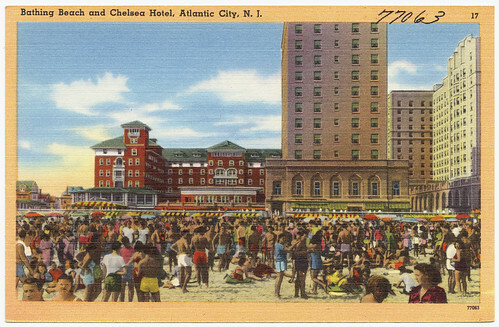 This card is an Atlantic City card from post WWII. This was the place to be! Somewhere in this crowd are my Mom and Dad, meeting for the first time on Chelsea Avenue Beach. If you look closely you might find them! In this card you can imagine the vibrancy and excitement of a changed world. It’s colorful yet realistic of the times after WWII. In the archives, Tichnor Brothers show more postcards of New Jersey than any other state, except for Florida. There are 2,408 New Jersey images, yet only 1,820 New York state images. In comparison there are only 88 Arizona images. So if you realize that I show more New Jersey postcards, yes it’s in my blood, but really there are so many out there to be enjoyed. See you on the beach! Our online shop is open 24 hours a day! Call for updates as we close now and then for deliveries, vacation and classes.